For my birthday, I went up to NYC with some friends. I wanted to stop in at Gimme! Coffee in Brooklyn to say hi to Chris Owens, so I called him to let him know that we would be in town. I let him know that we were going to visit some of the other shops in the borough and much to my surprise, he generously offered to give us the VIP treatment and be our guide (on his day off!). The next day, we met at Gimme! and jump-started the morning with an exquisite espresso pulled from their new GB5. Smooth and buttery, with loads of body, it is one of my favorite espresso blends. 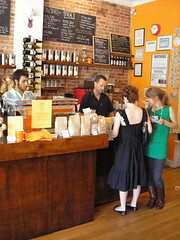 Newly energized and ready to tackle the Brooklyn traffic, we set off for our first stop – Café Grumpy. 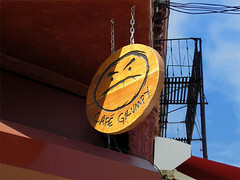 Café Grumpy is located in Greenpoint, Brooklyn, in an industrial-looking area. Without our expert navigators, Chris and his girlfriend M'lissa, we would probably never have found it. We were introduced to the owners, husband and wife Chris Timbrell and Caroline Bell, who showed us around their pride and joy. And it is a very nice shop with exposed brick walls, antique wood floors, and local art. Of course, the true measure of a shop (in my opinion) is the coffee, and in that department, they don’t disappoint. They have a Synesso Cyncra, and the shot that I had was smooth and sweet. It was the first time that I’d tried Counter Culture’s Espresso Aficionado and I preferred it over the Toscano blend, though it’s no slouch by any means. Chris showed us some plans that he had for a shop over in Manhattan, in Chelsea. If it’s anything like his current shop, it’ll be a success (and when it comes to espresso, Manhattan needs all the help it can get!) 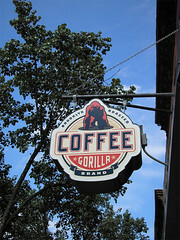 Next stop… Gorilla Coffee. As we drove up 5th Avenue, I could see the throng of people waiting to get inside. We assumed our place in line and waited as it slowly snaked its way through the door and into the shop, affording us the opportunity to view the display of Gorillawear t-shirts and mugs. Front and center on the counter sat a retro-style Faema E61 Jubilee. Decked out in chrome, brass, and red neon, it’s a stunning piece of gear. This shop really seems to be at the heart of the neighborhood, a true “third place.” If only all shops could bring an area together like this.